There’s only the two of us now: my daughter and I. My husband spends the day out, working in Barcelona city and my “baby” and I spend the day… in front of the computer!!!! She goes to Imvu, to Messenger, to her blog and to YouTube and I go to your blogs :D and write my posts. I still cannot believe how fast time goes by when I’m in the net! I think that this month is Google’s 10 Aniversary and I want to offer them this post with all my love and gratitude for letting me discover one of my life passions and let me enjoy it for FREE!!! Thank you from the bottom of my heart guys! I’ve downloaded Google Chrome navigator. It’s still in Beta but I think I couldn’t go back to Explorer… it’s so easy to manage, so friendly, so neat… I encourage you all to try it :D. Thanks again Google for this new wonderful tool! Back to the chicken that’s getting a bit bored up there waiting… as I was telling you, since we are only two for lunch here I made this drunken chicken with two purposes: First to eat their tender and crunchy legs for lunch and second, to have supertasty croquettes for dinner for the 3 of us. Drunken Chicken. Ingredients for 4 servings: 1 chicken, 2 tablespoons of dry thyme, 2 tablespoons of dry oregano, some olive oil, salt and black ground pepper and half a can of beer. 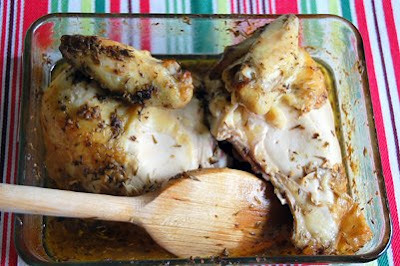 Clean and wash the chicken, dry it and rub it with the mixture you will have ready: the herbs, salt and pepper and enough olive oil to get a fine texture. Place the chicken in an oven recipient and pour the beer inside it and over it. Place in the middle rack for 80 minutes aprox. It depends on the size of your chicken. With the two breasts and wings prepare the croquettes. Drunken Chicken Croquettes. Ingredients for 4 or more servings: 2 chicken breasts and its wings, 3 tablespoons of all purpose flour, 2 glasses of milk, 2 medium onions, 1 teaspoon of ground nutmeg, olive oil, salt and black ground pepper, 1 egg and some breadcrumbs. Let the breasts rest into the chicken’s remaining sauce during some time in the fridge. Take the skin off the breasts and the bones and cut the meat in small pieces. Keep the chicken’s sauce. Heat a sauce pan with some olive oil in it (enough to cover the surface) and add the onions chopped in small dices. Stir and wait until transparent and soft. Add the chicken pieces. If needed, add some more olive oil. Mix and stir with the onion, if it gets too dry after a while, add some of the chicken’s sauce. Cook at medium heat until it becomes a paste (minimum 12 minuts, stirring all the time). If you don’t succeed much, use a food processor to get that paste. Once you have it, add the flour outside the heat, stir and when you don’t see it anymore put the pan back to the heat and add the milk little by little while stirring. After 5 minutes aprox. add the nutmeg. When the paste doesn’t get adhered to the sides of the pan it means that is done. Taste and add more salt and pepper if you wish. Let it cool down at room temperature first, covered with a cloth and once cold, place in the fridge. Now, when the paste is cold and only when it’s cold, wash your hands carefully and shape the croquettes. Beat the egg in a bowl and put the croquettes in, one by one, so that they get the egg all around, then, place them in a bowl full of breadcrumbs and coat them. Heat some olive oil in a pot (I don’t have a frying machine and the pot helps). Don’t let the oil burn, when you see it’s hot enough throw the croquettes in one by one. They should fry and get this beautiful golden colour. Once golden, place over some kitchen paper to let there the excess of oil. You will love them!!! And your kids… more! If you want to know what I would have as a first to complete this menu, then try this: Zucchini’s Puree. Your chicken looks so moist! 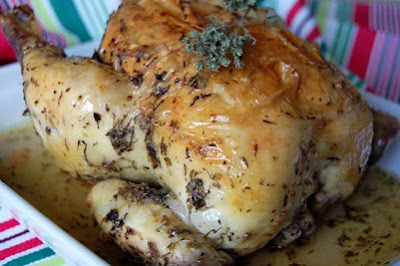 The drunken roast chicken sounds delicious I don’t think I’d be able to make croquettes anymore! The drunken chicken is superb Nuria! And the croquettes look even better…I really love the crunchy crust on them! Hola Peter! Yes, the contrast between the crusty outside and the soft inner filling is great :D. Want to come for dinner? Love the drunken chicken croquettes! My girls would love those! Ooh, those chicken croquettes look to die for. Versatile use of the chicken! Great stuff. My children will also love this and I think I will make it soon. Your croquettes look so perfect. crisp and crunchy … lovely entry. thanks, dear nuria. Nuria, croquettes are my FAVORITE thing to do with leftover roast chicken and your drunken version looks so tasty! You definitely have me craving some! My son would completely adore these! (And so would I). It’s funny you should mention Google, I have actually considered switching over to WordPress lately. I don’t think that I will, though – Blogspot is so familiar and easy. I would make the chicken firstly because it looks yummy but also because I like saying drunken chicken. The croquettes – now there’s something that could be a staple for me. Hey EatingClub! You can always add some cured ham or Iberian…. that would make them shine!!!! Hola Jen :D My daughter becames the Monster-of-the-croquettes when they are on the table! Hola Katie! I have considered that too… but yes, blogger is easy and I would have to dedicate so many hours moving my posts… too much work! 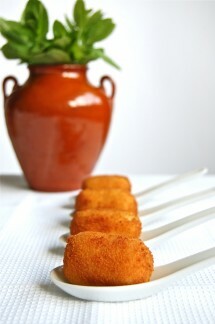 Hola Giz :D. Croquettes are one of our favourite tapas! You should give them a try in your next celebration! 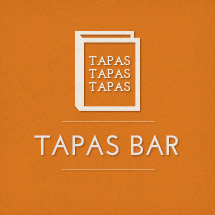 Spanish Gastronomy trapped you? Didn’t it? ;D. I’m a little jealous you have all those Hams so handy! A droolworthy post from top to bottom…..Both recipes look so divine!!! Nuria, thank you so much for coming to my site. I’m so glad to discover your blog. I’m going to list it in my favorites. I love Spanish cooking. How wonderul it must be to be living in Barcelona. Your chicken dish reminds me of beer can chicken that we make here, but you actually sit a whole fryer on the grill with a can of beer sticking up it’s you know what. This is much more civilized and one that I am going to try without waiting for my husband to fire up the grill. Thank you for the great post and the congrats. I love your blog. I have a love/hate relationship with Google. Yes their products and software are amazing and so easy to use that Microsoft looks like amateurs, but at the same time Google is getting so big that soon they’ll have the power to control our lives :-\ Anyway I loved this recipe. That first picture is making me hungry! that chicken looks scrumptious, but the croquette… well, that’s what i really want right now! i keep forgetting to come by because you have been AWOL. but mmm i love chickens! Hola Deeba! The alcohol evaporates… but you already knew that ;D. I had to throw away the other half… I’m on diet… the summer was too heavy on me… and my waist!!! WOW! Those look delicious! I love how you made two recipes from one chicken! Both look great! que croquetas mas ricas… que envidia! As you know, I love croquettes from leftover chicken! Yours are so beautiful, so golden and perfect, I could eat a whole plate of them. Hola Heather! I set the croquettes and some wine and you bring some squash flowers… have we got a deal? hola denuevo. i’m adding you to my blog roll. Hola Bren! Thank you darling :D. I’ll do the same! Hola Antonio! 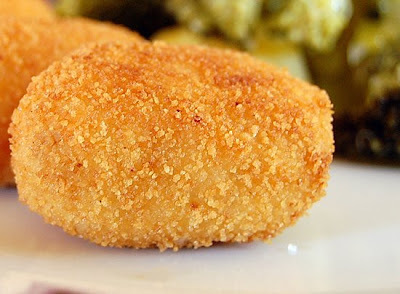 Mmmmm las croquetas de jamón me encantan también :D. Una buena tapa de croquetas sienta bien siempre!!! Thank you for this fantastic recipe. 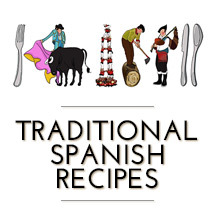 I tried it for my Spanish pall and she absolutely loved them and so did I.
I’d love to try to make croquetas with Spanish ham and cheese. Any suggestions? Thanks Rhialto! That’s great news :D. I never made croquettes with cheese (I am not a cheese lover). 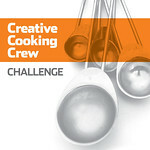 I’ll try to look for a recipe and publish the link here. Hi there =) I made the drunken whole chicken and it came out super delicious! For the next time I’ll have to make the croquettes. Great recipe!